89 Commercial Real Estate & Properties in Strathpine are listed in 7 categories. We have 49 Retail ShopsSale & Lease , 25 OfficesSale & Lease , 6 Medical and Consulting PropertiesSale & Lease , 5 Development LandsSale & Lease , 2 Other Commercial PropertiesSale & Lease and 1 Industrial Warehouses Sale & Lease . Ray White Commercial Northern Corridor Group and MMJ Real Estate as Exclusive Leasing Agents are pleased to offer to the market for lease Tenancy 1B at 130 Gympie Road, Strathpine. bull; Highly suitable for Retail Medical/Allied Health users bull; In a complex with high profile national tenant Officeworks, GP and Pharmacy bull; High level of passing vehicle and foot traffic bull; Commercial Zoned Premises bull; Excellent quality Showroom/Retail space bull; Exceptional Exposure to Gympie Rd bull; Premises signage available bull; Roller door access to storeroom bull; Own internal amenities bull; Good onsite parking/close to public transport For more information or to arrange an inspection please contact the exclusive leasing agents Trevor Nelson Jones and Peter Laurent from Ray White Commercial and Joel Wald from MMJ Real Estate. Ray White Commercial Northern Corridor Group as pleased to offer to the market for lease Unit 1 at 327 Gympie Road Strathpine. The tenancy has prime main Gympie Road exposure in the centre of Strathpine's CBD a few short steps from the Strathpine Centre. Properties like this rarely become available on Gympie Road, however this the Bank of Queensland leaving it presents an ideal opportunity for a new business to secure this prime location. Property highlights include: 185 sqm of lettable internal space Current modern fit out in place Modern Building Amenities Air conditioned Ample car parks Fast internet internet Excellent signage Close to bus railway stations, Courts Strathpine Centre For more information or to arrange and inspection, please contact agents Trevor Nelson Jones Peter Laurent from Ray White Commercial. Ray White Commercial is pleased to offer to the market for lease ground floor unit at 520 Gympie Road, Strathpine. Situated with frontage and exposure to Gympie Road this small retail/office space is ideal for a sole operator or small business who wants to maximise their exposure to Gympie Road at a highly affordable entry level price. Basic quality fit out provided to both lower units. Ready for furniture then ready to go. Minimal costs for tenants to be up and running'. bull; Newly completed building modern presentation bull; Walking distance to Bray Park Station bull; Great exposure to Gympie Road bull; Dedicated ducted Aircon bull; Bathroom quality fit out including shower bull; Multiple power points bull; IT friendly cable ready skirting board. bull; Lease comes with X 1 dedicated car park with customer access to 16 shared' sites. bull; Lease comes with X 1 building advertisement space under the veranda eave 1.5 m x.5 m bull; Excellent site security with 24/7 back to base monitoring / surveillance cameras. Property has weekly outside cleaning / maintenance contract to keep it neat. Walk to Bray Park station. Easy access to M1 Long lease with options available Suit accountant, financial planner, solicitor, hairdresser etc Indicative Rent being asked $ 360 380 / wk inclusive of all outgoings (except electricity) Incentives for discussion pending the tenant and lease length proposed. bull; Property has weekly outside cleaning / maintenance contract to keep it neat. bull; Indicative Rent being asked $ 360 380 / wk inclusive of all outgoings (except electricity) Incentives for discussion pending the tenant and lease length proposed. Ray White Commercial is pleased to offer to the market for lease ground floor unit at 520 Gympie Road, Strathpine. This small retail/office space is ideal for a sole operator or small business who wants to maximise a central Strathpine location with signage on Gympie Road at a highly affordable entry level price. Basic quality fit out provided to both lower units. Ready for furniture then ready to go. Minimal costs for tenants to be up and running'. bull; Newly completed building modern presentation bull; Walking distance to Bray Park Station bull; Great exposure to Gympie Road bull; Dedicated ducted Aircon bull; Bathroom quality fit out bull; Multiple power points bull; IT friendly cable ready skirting board. bull; Lease comes with X 1 dedicated car park with customer access to 16 shared' sites. bull; Lease comes with X 1 building advertisement space under the veranda eave 1.5 m x.5 m bull; Excellent site security with 24/7 back to base monitoring / surveillance cameras. Property has weekly outside cleaning / maintenance contract to keep it neat. Walk to Bray Park station. Easy access to M1 Long lease with options available Suit accountant, financial planner, solicitor, hairdresser etc Indicative Rent being asked $ 360 380 / wk inclusive of all outgoings (except electricity) Incentives for discussion pending the tenant and lease length proposed. bull; Property has weekly outside cleaning / maintenance contract to keep it neat. Indicative Rent being asked to $ 320 340 / wk inclusive of all outgoings (except electricity). Incentives for discussion pending the tenant and lease length proposed. 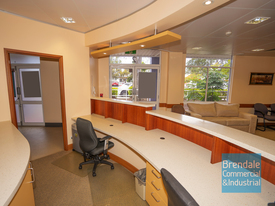 130 m2 fitted medical suites ready to go Spacious waiting room Large reception desk with filing storage 4 separate office with wash basins Ducted air conditioning Security system Data phone provision Kitchen meals area Internal toilet amenities Plenty of off street parking Will be leased with all fixtures fittings Located in the Strathpine Medical Precinct. Fully fitted out medical suites with quality presentation. Call The Commercial Guys today to book your inspection or for further information. Unless otherwise stated, the price/property may be subject to GST and/or outgoings. 187m2 Office Suite $40,000 PA + Outgoings + ..
331m2 Retail Showroom Or Office Suite $99,000 PA + Outgoings + ..
Great Parking And Exposure On Gympie Road! $4,020.80 pcm Gross plus ..
Ray White Commercial Northern Corridor Group and MMJ Real Estate as Exclusive Leasing Agents are pleased to offer to the market for lease Tenancy 1A at 130 Gympie Road, Strathpine. bull; NLA 502m2 bull; Highly suitable for Retail Medical/Allied Health users bull; In a complex with high profile national tenant Officeworks, GP and Pharmacy bull; High level of passing vehicle and foot traffic bull; Commercial Zoned Premises bull; Excellent quality Showroom/Retail space bull; Exceptional Exposure to Gympie Rd bull; Premises signage available bull; Roller door access to storeroom bull; Own internal amenities bull; Good onsite parking/close to public transport For more information or to arrange an inspection please contact the exclusive leasing agents Trevor Nelson Jones and Peter Laurent from Ray White Commercial and Joel Wald from MMJ Real Estate.